1MB Travels: Las Vegas: Craftsteak at the MGM Grand - Viva Top Chefs in Las Vegas! 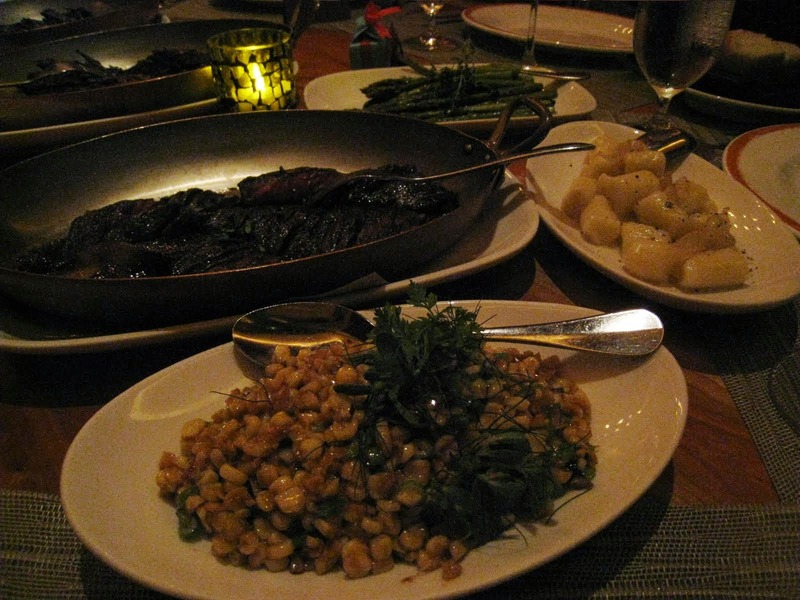 In a city notorious for 'excess' - Tom Colicchio's Craftsteak stands a cut above the rest as much for its noble restraint from over-the-top showmanship, as the art and skill subtly yet unmistakably exhibited in its take on classic steakhouse dishes. Located in the heart of the MGM Grand, Craftsteak is both a mecca to which foodies find themselves making pilgrimmage, and an 'accidental' find for tourists coming through its illustrious "Grand Garden" arena. Though the MGM Grand itself, like the city it calls home, is not really known for subtle sophistication - it does boast a lion's share (had to do it, sorry!) of restaurants within its "Grand Garden" arena that offer fine dining in tasteful settings. Craftsteak can be found, after a long hike through the casino, among the serenity of this row - with the lights and noise thankfully dialed down to an ambient level. On this particular occasion, we were at Craftsteak to celebrate a friend's birthday - commandeering a coveted table in the semi-private dining room (which we ended up sharing with a Jonas Brother!). The decor is rich, warm and welcoming, with its dark wood furniture and wall panels. The room fit four tables of eight to ten people, affording a cozy space for an intimate, yet lively, dinner. As we were a large group, the birthday girl had mapped out our three-course meal in advance - so some of the items I will attempt to capture for you below may not be on the regular menu (though most appear to be, as noted). Our dinner was served family style - the better for everyone to get to experience multiple dishes during each course. 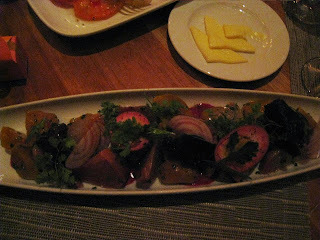 Heirloom Tomato, Baby Beets with Pickled Egg, and Warm Frisee. The Heirloom Tomato salad was unbelievable - beautifully designed to showcase the perfectly ripened tomatoes for the eyes and the palate. 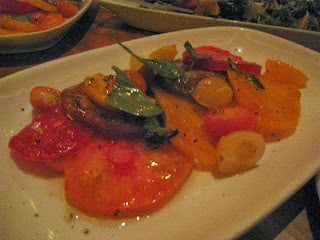 Plump tomatoes of varying colors and sizes are brushed with olive oil and topped with thai basil. The simplicity in the preparation of this dish allows the natural sweetness and juicy-ness of the tomatoes to shine through. Next was the Baby Beets with Pickled Egg - which was impressive in its originality. The creamy/slightly rubbery texture of the single pickled, hard-boiled egg served as a nice counterpoint to the abundance of softly crunchy multi-colored beets in the dish, punctuating it with a provocative extra kick of acidity. Fresh sprigs of herbs are thrown into the mix for good measure, adding pops of contrasting color, texture and savory flavor. This is probably the best beet salad I've had outside of L.A.
sampler is the Warm Frisee Salad, with a deliciously runny egg and shamelessly fat-addled pieces of bacon strewn through the spiny leaves of frisee. I'm very glad I got to experience this dish before the whole egg scare broke - I'm a big fan of barely cooked eggs - and in this dish, the smooth 'liquid gold' of the lightly poached egg yolk nicely offsets the unruly spines of the frisee. 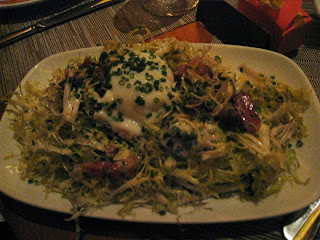 The saltiness and grease from the bacon flavors the dish and brings the otherwise disparate elements together. 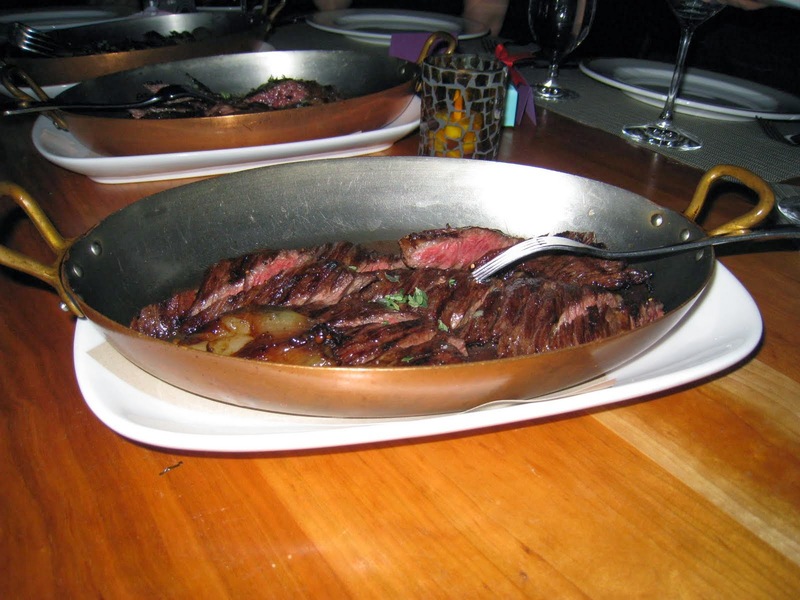 After grazing on the feast of salads and very reluctantly letting servers clear the few remaining scraps away, we set our sights on the main course - Wagyu beef, cooked medium rare and served in beautiful copper cookware. Words failed me at first taste of these steak strips - gorgeously balanced portions of muscle and fat, perfectly seasoned to let the texture and natural flavors of the meat serve as testimony to its quality. If not for the need to maintain some semblance of decorum, I would have picked up the pan and licked every last drizzle clean. Though the steak was such pure joy to experience, and did not need any accompaniment, our wonderful hostess made sure we had a plethora of side dishes to stimulate our taste buds. One of these dishes was potato gnocchi - giant, soft, light and gently flavored pillows that provided a nice contrast to the texture of the beef. We also had asparagus and some sort of corn concoction that I regret not hounding the waiter until he provided all the specifics for. The plate of 'corn mix' was like no other corn focused dish I had ever tasted - it was hard to identify all the layers of flavor in it, though it did not look complicated - but suffice it to say it was simply incredible. All in all, those who appreciate great food, in a nice atmosphere, with attentive yet unobtrusive service - and without the pretentiousness - would fall deeply in love with Craftsteak at the MGM Grand. Kudos to Tom Colicchio for showing Top Chefs who's boss! Now, if only you would open a location in Los Angeles, so that we can indulge in the magnificence of your culinary coup with greater frequency! Love Gordon Ramsay (when he's actually helping people on Kitchen Nightmares)? Enter the Bloomspot London West Hollywood Giveaway Sweepstakes for a chance to win a $1000 rooftop pool party at the London West Hollywood, with food & drinks from Gordon Ramsay's restaurant! Sweepstakes ends 8/26/2010 at 11:59pm PST! Limit ONE sweepstakes entry per person. No purchase required. Open to entrants 21 years of age or older and legal residents of California only. See Official Rules. Check out my Sweepstakes Page "Win Your Next (Fine Dining) Bite" - for more awesome promotions!